Yes its 85 years since this great club Arncliffe Scots was started. The Arncliffe Scots Club has been playing Rugby League in the St. George District since 1926 celebrating its 85th Anniversary in 2001. This year (2011) will see Scots celebrate its 85th year of playing football. Over this period Scots has become one of the most renowned and respected clubs in Rugby League, its famous jersey and colours are recognised Australia wide. It has established a name for Sportsmanship and Fair Play and is held in high esteem in all Rugby League circles. The impressive record of competition wins and the number of players the club has prepared for St. George and higher honours is second to none. In 1913 members of the Arncliffe Presbyterian Church formed a cricket club. Being mostly of Scottish heritage they called the club Arncliffe Scots. In 1926 some of the young cricketers formed the Rugby League Club. The first colours were Black and Gold. When the club reformed after the war, the red was added to the now famous strip and the Scottish thistle was kept as the Emblem. In 1926 the club fielded one B grade and two C grade teams. In those early years there was competition for A, B and C grade only. In 1928 the club fielded A, B and C grade teams. There were no finals in those days, the winner was first past the post. Both C and A grade won in 1928; the C grade a fortnight before the A grade. The club continued to be strong, fielding teams in every grade until the outbreak of the Second World War. The club’s home ground was the famous Earl Park; this was also St. George’s home ground. The club did not operate during the war years. In 1947 Percy Davis, Glyn Price and Tiger Black called a meeting to reform the club. From 1947 to 1960 the competition level ended at E grade (under 16). Scots always fielded sides in every grade and to this day hold the record for the most Senior Club Championships. 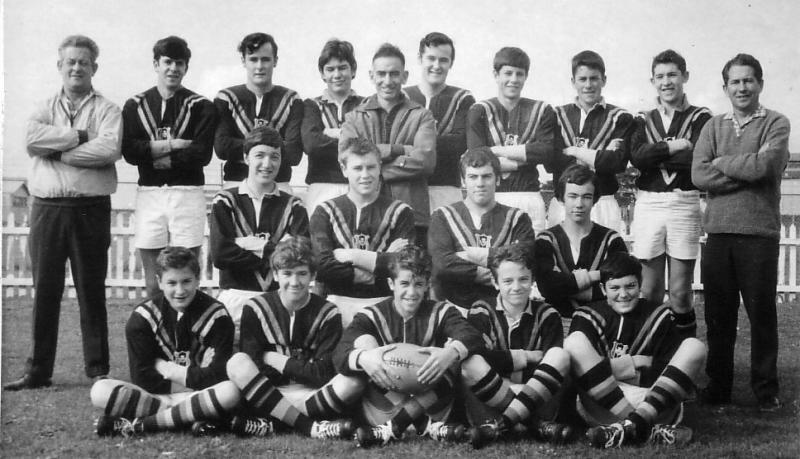 During the period between 1953 and 1961 Scots won 6 out of 8 A grade premierships. In 1960 Cahill Park was acquired as the clubs “Home Ground”. In the first few years the field ran the opposite way, the playing field was surrounded by a white picket fence and the entire ground was enclosed by a wire fence. This allowed Scots to charge entry “but only to the opposition”. Season 2000 saw Scots celebrate 40 years of playing on Cahill Park. When the N.S.W. League introduced Second Division in 1963, it was to promote the outer and new districts. Scots was the only junior club from an existing district accepted. This was on the recommendation of the A.R.L. President Bill Buckley with the words “Gentlemen we need the best junior club in NSW in this competition and that club is Arncliffe Scots”. Scots has always had both officials and players who have shown their loyalty and love of the club by giving many years of service. In 1970 the Percy Davis Award for 10 successive playing seasons was introduced and the first player to receive this award was Colin Bramley. Since then over 80 players have celebrated 10 years of playing service. Three players – Philip Green, Ian Maclean Jnr and Paul Francis – earned life membership for 20 successive playing seasons, with Ian going on to play for 25 years. In 2004 a plaque called the Ian Maclean Jnr Honour Board was introduced to hold the names of the 15 year, 20 year and 25 year players. Officials in Percy Davis, Alan Parry, Jack Hannon, Ron Jarrett, Frank Lobina and Glenys Davis-Ellis have all clocked up 20 years -Percy giving 40 as President alone, and Glenys will celebrate 35 years service this year (2004). From the very early years Scots has been a breeding ground for St. George – by 1930 six of the early Scots players had gone to grade. The club has strived to send as many boys on the further honours as possible; Ross Kite, John King, Bruce Starkey and Pat Jarvis among the best of these. 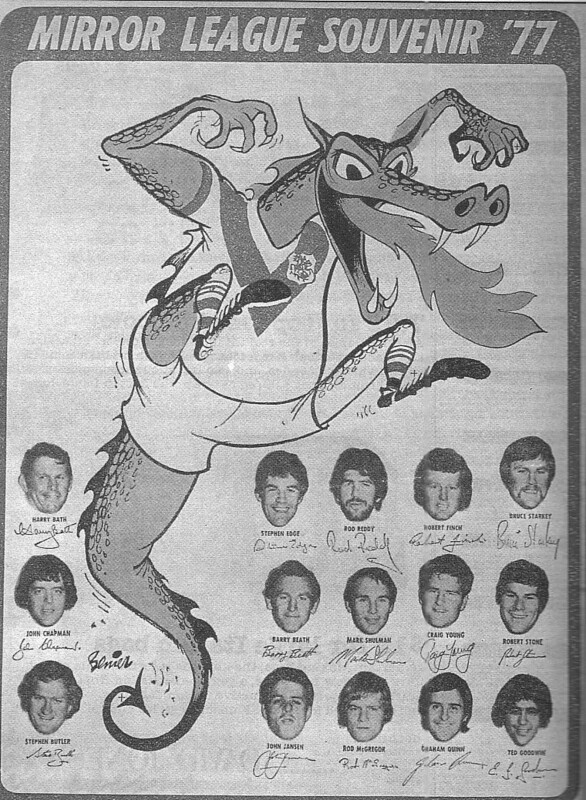 The famous drawn Grand Final of 1977 had no less than four Scots players in the St. George line-up. Scots has also proved a great breeding ground for officials. St. George has long been served by officials from Scots. Tiger Black the famous Saint and Broadcaster, Arthur Davis President NSW Referees, Glyn Price (Mr. St. George) and Alex Mackie Vice President A.R.L. host to the Queens visit were all loyal Scots to name just a few. The song was written by Henry Howard and A. grade player from the late 40′s who composed it as an after match drinking song. It has been sung in dressing rooms and at functions ever since. This is a title only Percy Davis can truly claim. He was the captain of the 1928 winning C. Grade, then the 1930 A grade side before being graded with St. George. He reformed the club in 1947 and became its President, a role he held for 40 years (turning down the President’s job at Saints to stay with his beloved Scots). He was the A grade coach in the early reforming years, and then when Scots started the little grades he again took on the role of coach to the young Scots. He was the visionary and founder of the Scots Licensed club and was its Secretary Manager for the first 20 years. He was and always will be Mr. Arncliffe Scots. 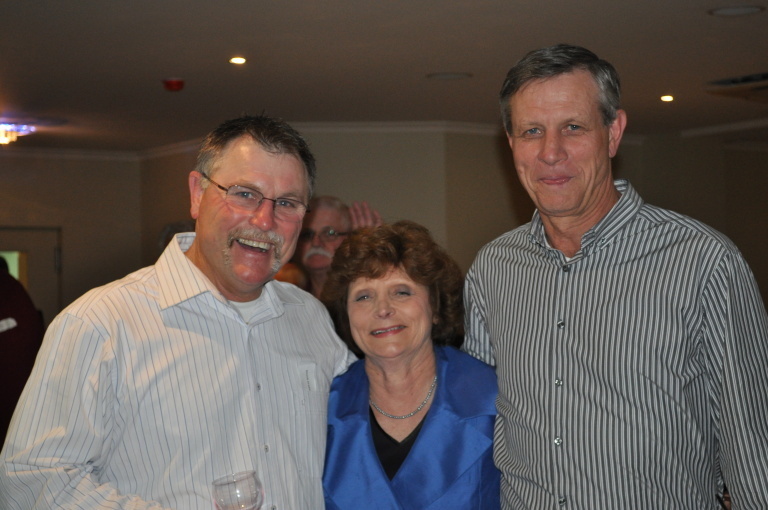 Col "Chip" Bramley came up with the good idea of holding a mini reunion of the old team and helping out the club. The 1970 D Grade side. 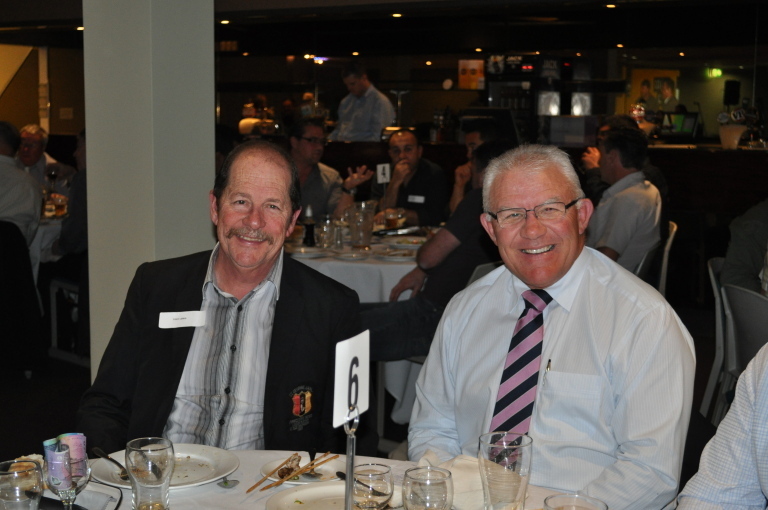 Footnote Dennis and I were classmates at MB Kogarah in the late '60s. Dennis in front of Ian Walsh. Bruce and I were classmates in the very early '60s at CBHS Lewisham. The A table that's Wayne Meredith under the spot light. It was great night had by all the food was above par and the chance to meet up again with the old team was good. 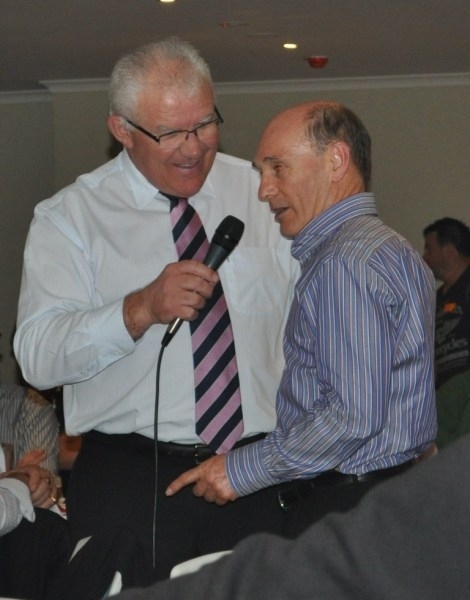 Cols dad and our coach Vic Bramley was unable to attend but his name was spoken of plenty of times that night.